This server has received 2229202 hits from both ipv4 and ipv6. 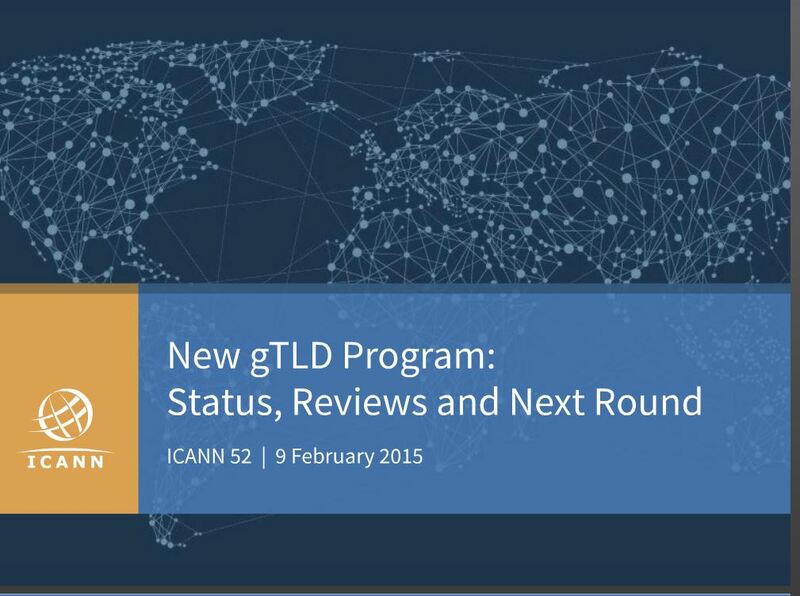 The recent publication of the ICANN reports for the month of December 2014 enables us to finally take stock of 2014, marked by the launch of the “new TLDs” (or “top-level domains”) expected since their announcement by ICANN in Paris in June 2008.
domains (known as “legacy gTLDs”, i.e. .com, .net, .org, .biz, .info, etc.) and the countrycode TLDs (or “ccTLDs”). 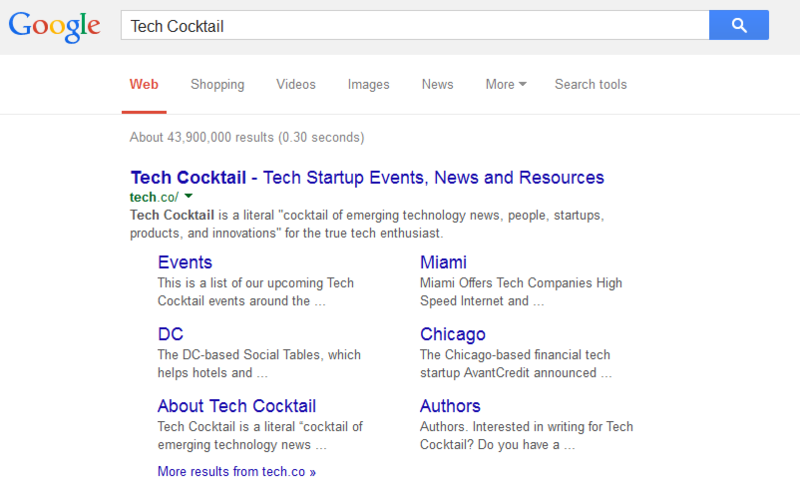 gTLDs, of which 3.8 million were nTLDs. compared with 55% at year-end 2013. 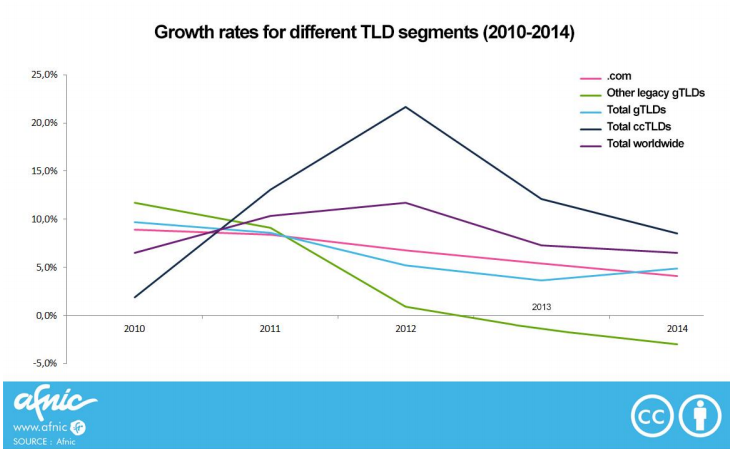 The emergence of nTLDs, therefore, has not been sufficient to allow gTLDs to regain a growth rate higher than that of ccTLDs. Global growth in the domain name market reached 6.5% in 2014 (Fig. 1), against 7.3% in 2013. However, this average masks contrasting dynamics. The country-code top-level domains (ccTLDs) continued to grow at a rate of 8.5%, that being a marked slowdown, however, compared with the two previous years. The .com dropped below 5%, while all in all gTLDs, boosted by the nTLDs introduced in 2014, experienced a slight upswing in growth. The major losers appear to be the legacy gTLDs (except for the .com), which lost 3% in stock after having already lost 1.3% in 2013. 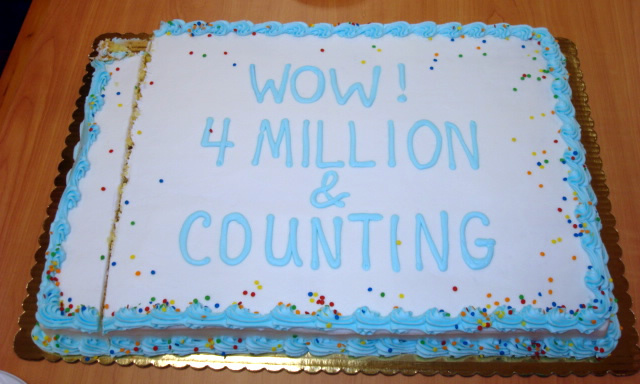 ICANN has announced the 500th new gTLD. The gTLD .NTT (Nippon Telegraph and Telephone) was the 500th new gTLD to be delegated, with new domains rolling out at an average of one per day. The New gTLD Program is the Internet’s largest expansion ever, introducing hundreds of new top-level domain names or “strings” which could become available in the next few years. With the first four strings delegated on 23 October 2014, the Program continues to make advancements and enable enhanced competition, innovation and choice. https://ntldstats.com/ reports there are now (just about) 4 million new top level domains registered – that’s more than a lot of country-code top level domains. The big news in the last few days is that .网址 which means .website in Chinese has gained over 1/4 million registrations in just 3 days. There is not a great deal of change in the percentage of domains being parked (unused) however. 67 per cent of the new domains are not yet being used for websites. Some lay the blame for this on the .xyz promotion. This domain, seemingly meaningless, has been heavily promoted by Network Solutions which has registered them to customers free of charge – controversially without asking the customers. Presumably they hope they’ll end up renewing them in a years time. London is a leading world city and a vibrant centre for business, investment, technology, creativity, education and tourism. London is made up of the City of London Corporation and 32 boroughs, has a population of 7,900,500 and is home to 331,540 businesses. London attracts over 100,000 international students from 200 nations to its higher education institutions and welcomes millions of visitors each year. London is the powerhouse of the UK economy and is Europe’s leading centre for technology. According to a recent report on London?s Digital Economy (GLA, 3 Jan 2012), there are over 23,000 ICT and software companies in London, the highest number of any European city. London hosts a quarter of all British jobs in computer and related activities and 22% of jobs in telecommunications. According to the Experian Business Strategies Regional Planning Service, in 2010 the Gross Value Added of communications companies in London was £7.9 billion. Link yourself with the place you’re proud to live and work in. Get the domain you’ve always wanted. Let London and the rest of the world know exactly where you are. Dot London domains will be on general sale from the 9th September 2014 at midday and we are expecting strong demand. The domains have no restrictions and are open to all. There are a total of 1751 new TLD applications, comprised of brands (635), generics (1060), and geographies (56). More than half of all brand TLDs fall into financial and technology verticals. Furthermore, 41% of brand TLDs were applied for by Fortune 500 companies, mostly in financial services, retail, technology and transportation. Will Switching Confuse My Customers? 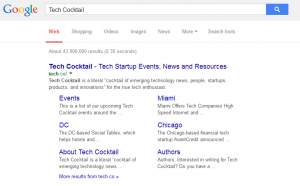 Website owners concerned that switching to an untried domain will lose their search engine ranking need not be concerned. extensions like .ca in the Canada and .cn in China. Combined names like .com.au and .co.uk make an even more complicated experience for global customers and brands”. 2020Media is an experienced domain name registrar – we can help you make the right choice in the new domain name space. Review our registrar services and contact us with your questions.